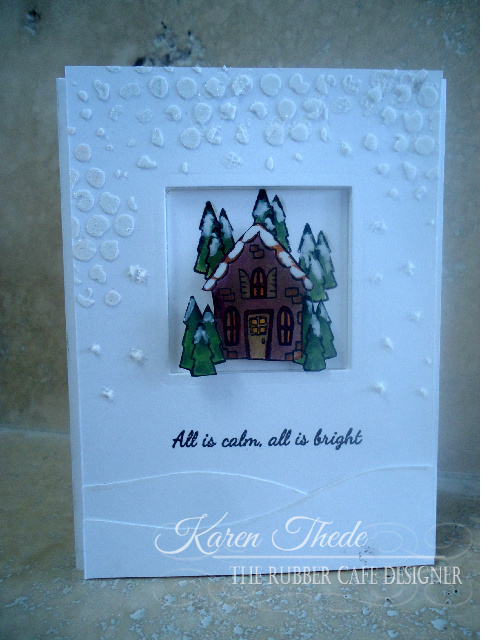 Hi - today's card I'm using the stamp set Home for the Holidays that comes along with your kit, I just love the houses and cluster of trees so had to create a little scene with them. I started by cutting out a 2" square in the front of my A2 card front - which was cut at 4 1/4 x 11 and scored at 5 1/2". To prep my scene, I stamped my house and a couple of the tree groups on a separate pc of white cardstock so I could color and fussy cut them out to build my scene. I did the house first so I could use this as a guide for my tree placement. Tracing lightly with a pencil I sketched lines around the house and began stamping my clusters of trees. These were stamped directly to the inside of the card, and I colored these to match the ones I'd colored and fussy cut earlier. Once they were ready I popped my house and the other 2 tree clusters on dimensional dots, and my scene was done! 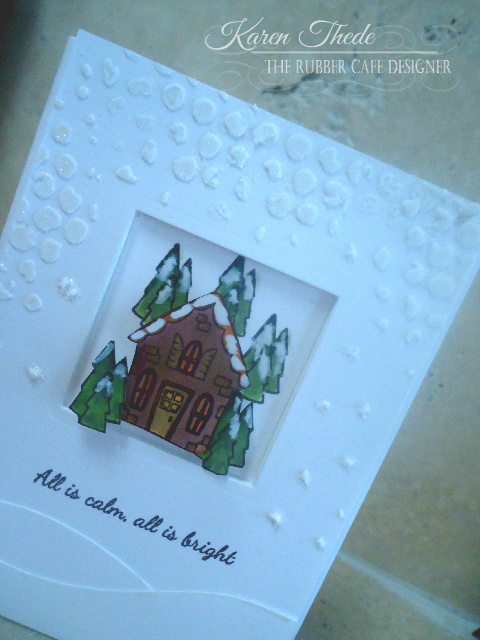 I decided I needed some texture or snow- so I used a stencil and some paste and created a snowy top portion on my card front. I dipped the tip of my brush into the paste to create some simple little snowflakes down the side. 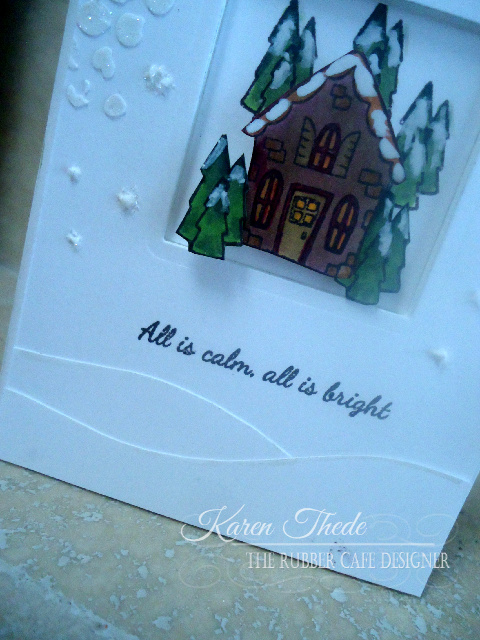 While this was still wet I used a sparkle ice embossing powder which stuck to the paste. I allowed that to dry before I took my heat gun to heat set the embossing powder. Letting it dry first helps in ensuring your embossing paste won't puff up and /or distort. In this case My dots at the top were already large enough so I wanted to maintain their size. At the bottom of my card, I wanted to create some more movement on my white base so I cut some layers, and just freehand cut the mounds of snow. I did two to layer one over the other - there are dies out there for this but you can easily achieve the same results with a pair of scissors! 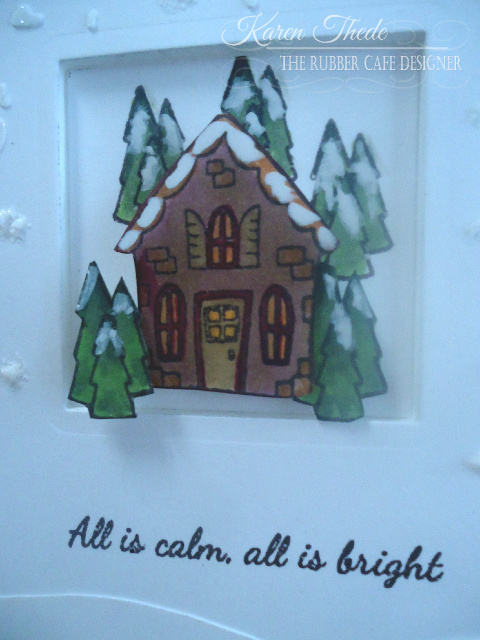 My simple All is calm, all is bright sentiment was perfect for this card, and just finished it off nicely at the bottom stamped in Memento Black Tuxedo. I also as a final touch took my Wink of Stella clear glimmer brush pen to my trees and roof top- I think since I had added snow they needed some too!